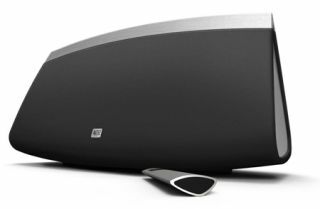 IFA 2011: Altec Lansing inAir 5000 is AirPlay enabled | What Hi-Fi? The words ‘iconic iPod dock’ immediately conjure up images of B&W’s Zeppelin, which joined the AirPlay party earlier this year. Altec Lansing now hopes to take the title as king of the iSpeakers with its AirPlay-compatible inAir 5000. It certainly looks the part, with its smooth curves and minimalist black and matte-metal finish. But this isn't just a case of form over function – that distinctive shape is designed to radiate sound out at a multitude of angles to ensure that soundwaves aren't broken up by anything in the way, ensuring better sound quality, the company claims. Under the skin, the inAir 5000 packs in three separate amps, while a USB port at the back doubles up as a charger/audio input for your iDevice of choice, which is an added bonus for those AirPlay-free moments when your battery is about to die. Available from early October (price to be confirmed), we'll be testing it as soon as we can.